Ask a European winemaker to tell you the scariest story they can think of, and there's a good chance most of them will tell you the same tale: the one about phylloxera. It's been a long time since phylloxera – a plague of tiny insects that feed on grapevines – wiped out the vast majority of European vineyards in the 1940s, but winemakers today are still feeling its effects. The insects attacked almost all of Europe's vines to such an extent that almost all continental wine you drink today – save for a few islands, like Santorini in Greece – will be made from vines that were brought over from the New World. They were then grafted on to the complex root systems that pull up nutrients from the earth and impart 'terroir', the soil's character, onto the grapes. 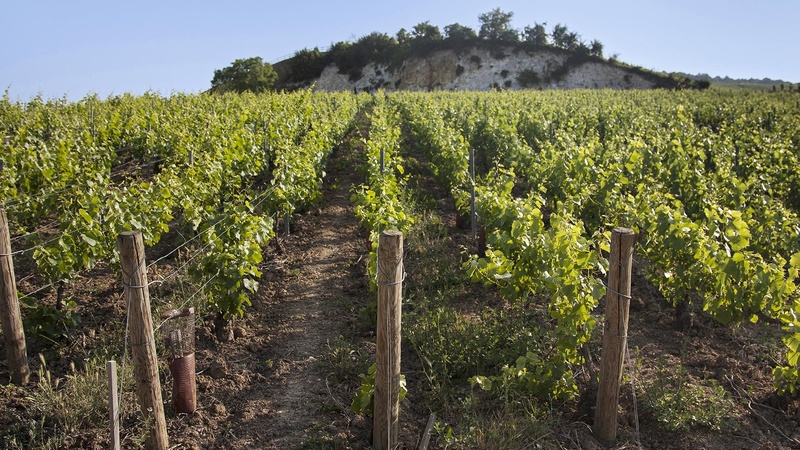 From Rioja to Bordeaux to Champagne – these regions are all running on borrowed vines. So, when looking around Champagne Bollinger's own vineyard in the historic champagne-making village of Ay, just down the road from Epernay, it's difficult not to feel a sense of history. 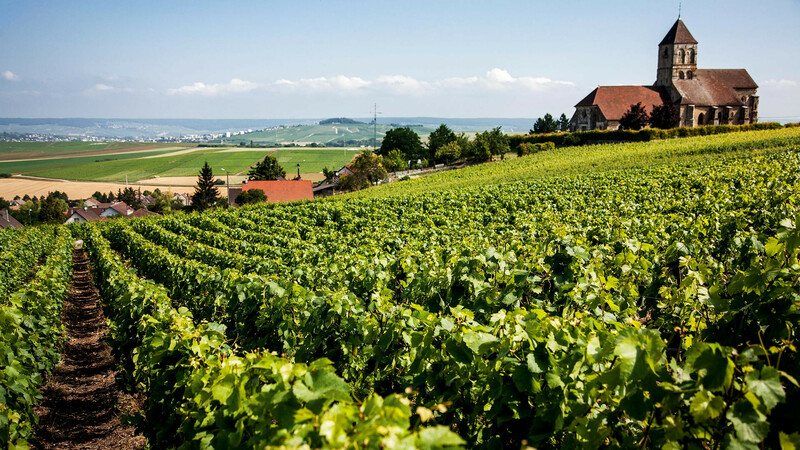 Because the historic maison just happens to own the only two vineyards in the whole of Champagne that have, somehow, remained phylloxera-free. The brand uses pinot noir grapes from these two small vineyards, on years when the harvest is good enough, to make a very special wine: the Vieilles Vignes Françaises – literally 'Old French Vines'. It retails at more than £1,000 per bottle, and remains the only champagne on the market that tastes exactly as it would have 100 years ago. The chances are you'll never get to try this wine. If you feel like you've heard of this champagne brand's name but you're struggling trying to place it, I've got two words for you: Ab Fab. A glass of 'Bolly' is a hallmark of the sitcom, and has both helped spread the brand's name in England – where there's a huge market for it, as for most champagne brands – and imbued it with a certain reputation; one that's possibly counteracted by a long-standing and rather more deliberate association with the Bond franchise. If you don't know it from either, you may well have drunk it: the brand's signature Special Cuvée is sold in supermarkets and wine shops around the UK, and, while Bollinger isn't one of champagne's powerhouses in terms of volume, it's still a big player. I'm here in Ay not to discover the Special Cuvée (although plenty of it is drunk on our trip) – nor the Vieilles Vignes Françaises. I'm here for a closer look at the maison's vintage champagnes. 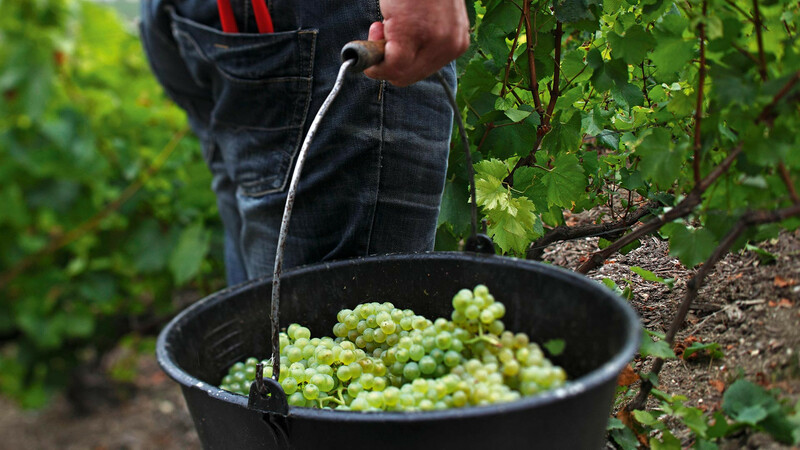 As you'd expect, these are wines made to celebrate a particular year's harvest, if it's especially good and can reflect the specific character of the grapes harvested. With the notable exception of Dom Pérignon and a few others, most champagne makers' hero products (including Bollinger's Special Cuvée) will largely be made up of the current years' harvest of chardonnay, pinot noir and pinot meunier, topped up with blends of wines from different years. The master blender's job – in Bollinger's case the quiet, studied Gilles Descôtes – is to put aside the urge to be creative and instead ensure quality, but also consistency, above all else: there's no age statement, so a Special Cuvée made in 2008 needs to taste pretty much the same as one made in 2013, and so on. La Grande Année, though, is different, and it's here where Descôtes gets the chance to experiment. This is the name given to the house's vintage champagnes, and they're created precisely because they're different. At a grand dinner at the former residence of the last matriarch of the house, Madame Bollinger, we get to taste a few different ones, alongside some classic (and delicious) French cooking. While the Special Cuvée – still an excellent champagne despite it being upstaged by its single-vintage counterparts on this occasion – is honeyed, with almond on the palate, lightly biscuity from being aged in contact with the lees (the yeast used in fermentation), the Grand Année 2007 is another thing entirely. It's floral, with loads of vanilla up top that gives way to orange blossom and honeysuckle notes. The Grand Année Rosé 2005 – a relatively recent foray for the house – is unlike any rosé I've tried before, sparkling or otherwise. Served in the brand's characteristic wide glasses (champagne flutes, while traditional and attractive, aren't a great vessel for aromatic wines as there's hardly any room for them to breathe), it's full of the fresh strawberry and raspberry notes you'd expect from a cool-climate sparkling rosé. But I taste it and it's alive with flavours of cocoa butter and pistachio. As someone who's more than happy to totally and unashamedly geek out about wine, to wax lyrical about aromas and flavours without particularly caring about sounding pretentious, this is a genuine treat. And it gets better when, after the Grand Année 2004 is brought out, there's a surprise. It's another Grand Année, but older, we're told. It's got a buttery popcorn smell that leaps out of the glass – a hallmark of champagnes that have aged for a long time in the bottle – but on the palate it's still got a good amount of fresh fruit flavours. We take guesses – 1998, 1994 – before someone hits on it: 1989. A year older than me. The dinner that night, and in particular the wines served alongside it, are an excellent primer for the next day. While we're looking around vineyards – Tauxiers, an open slab of land where verdant green vines meet crushing grey skies, the only dot on the landscape a small shed, and 'La Côte aux Enfants', so-called because the steepness of its hills mean that only nimble children can get up there to pick the grapes – we learn that Bollinger is one of the few winemakers to have been imbued with the Sustainable Viticulture Award, and that all of its farming practices are organic. The reason it can't claim to be a 100% organic product now is simply because of the roots: they reach so far down into the ground that some of the residual soil and the water table have probably come into contact with fertilisers and pesticides in the decades before. While perusing the vineyards and touring the winery, the creativity and history of what we've tasted the night before is fresh in the mind. It's even more so when we take a deep dive into what we learn is the heart and soul of Bollinger's operation: the cellars. 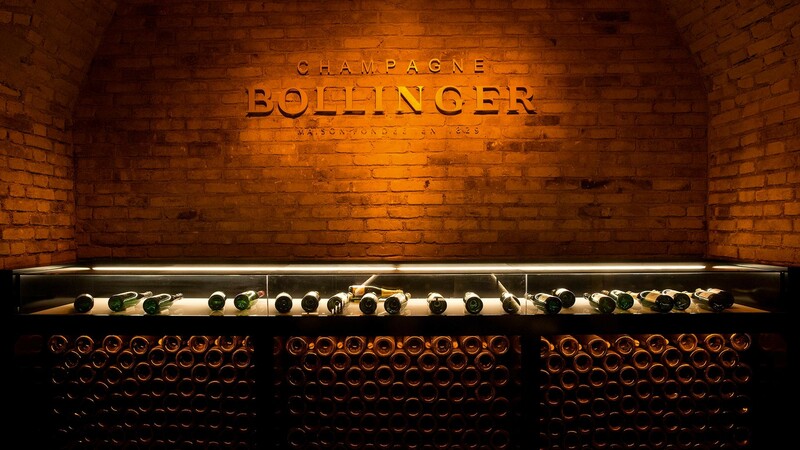 Bollinger's approach to wine places a huge emphasis on ageing – even in its Special Cuvée, the wines used are aged for an average of more than double what's required by the regulations of the Champagne AOC – and we walk past countless magnums containing what Descôtes refers to as "reserve wines"; wines laid down to age ahead of being used as what he calls "spices" in the creation of the non-vintage wines, spiking them with hits of the deeply aromatic notes they hold. The cellars are beautiful, beguiling, snaking catacomb-like for literally miles underneath the village. They're quietly immaculate in the geometry and symmetry of the paths, barrels and the backs of the innumerable reserve wine bottles. A thick layer of dust covers everything. We fumble in the dark around a tiny sub-cellar where, in 2010, an intern found a collection of the brand's first vintage from 1830 entirely by accident. Needless to say, he has a job for life – Guillaume graduated from intern to an integral part of the brand's team in the lab, where they study the effects of ageing and environment. Later, we walk past bottles of the most recent La Grande Année vintage (2014, which will likely be released in 2023), and a room of Special Cuvée that a sign tells me is stacked with just under 250,000 bottles, and I notice the paths in the cellars have street names. We follow Gilles through them, and at the end of one the history and tradition of the brand is hammered home. 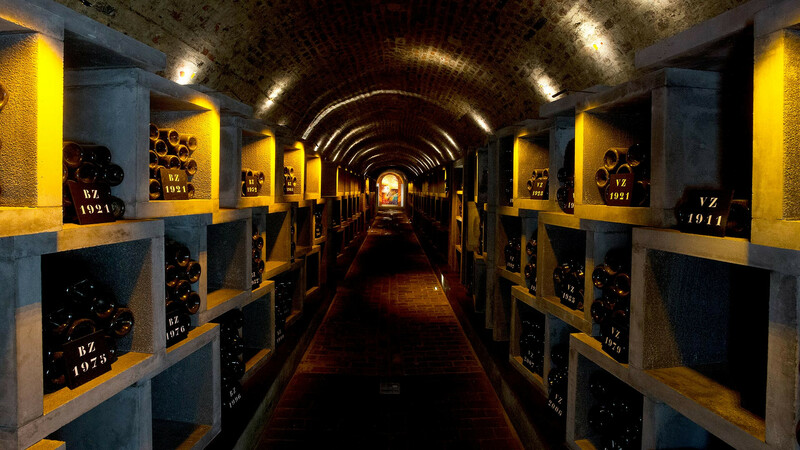 La Réserve is a newly renovated part of the cellar that's home to some of the brand's oldest and rarest reserve wines. It's like a library, some of the bottles dating back to the late 1800s, each of them saying something about the time in history they were made. And in the adjacent Galerie 1829, there are some extremely old and rare bottles from elsewhere in the brand's history. The 239 remaining bottles of La Grand Année 1973, for example – the wine served at the wedding of Prince Charles and Princess Diana; Vieilles Vignes Françaises from the mid-1900s whose market value must be eye-watering. But if I thought the 1989 was a surprise, I was about to get an even bigger one. On a giant converted barrel sits a magnum of very, very old-looking champagne. I crane my neck to get a glance at the bottle and just about make out the vintage: 1937. Nineteen thirty-seven. It's so old that it can't legally be sold as champagne, because the pressure in the bottle will have fallen to below the Champagne AOC's requirements, so the only place in the world it'll ever be tasted is here in this room. Needless to say, I'm excited. There's something ritualistic in the preparation of this piece of bottled history. We're huddled in the dark chamber, no one daring to do more than breathe, as Descôtes slowly opens removes the cork with a very gentle hiss. He's the first to try it, and he lapses into French upon tasting it. "C'est bon," he murmurs. "C'est très, très bon." It's clear this is a treat even for him. I swill it lazily in my glass, trying to absorb every ounce of aroma. The nose is all honey and poached pears, and as I sip it I can't help but break into a smile. It's an 80-year-old wine but there's still an absurd amount of fresh-fruit flavour – peach and a hint of orange peel – along with toffee notes, toast, biscuit, a bit of smoke – and there's still a presence of fine bubbles, despite its age. It is, quite frankly, one of the most incredible-tasting wines I'm likely to ever drink. And it's a reminder of what an almighty product a beautiful champagne is: Bollinger might be constantly looking to innovate and stay current, but at its heart it's producing wines in the same way it has for generations. You can't buy history; but Bollinger shows that if you can harness it this spectacularly, you end up with something very special indeed.